With the publication of Global Burden of Disease (Lancet Oct. 8, 2016), it is now clear that brain health is at the forefront of diseases leading to morbidity and mortality. Moreover, if we combine neurological, mental, developmental, and substance-use disorders (NMDS), then the group is the leading cause of mortality and morbidity, surpassing cancer and cardiac disease. These facts, in my opinion, have not trickled to the policymakers, let alone the public. If this does not happen, then desperately required funding and support would not follow soon. Neurologists have to be more proactive in “promoting” the discipline across the world. In many parts of the world, our numbers are so small that the sheer number of patients overwhelms us, and our specialty is not recognized as a priority by governments. At times, we have to explain our discipline to the lay public, as the neurology profession is not instantly recognizable. In the eyes of many, being a heart specialist is easy to comprehend while a neurologist may not be. We may have to use the word “brain” more liberally, and stating that we are a “brain specialist” could be an option, which may perhaps be more recognizable. Although this does not cover those of us who look after the disorders of the peripheral nervous system, in my opinion, the issue of recognition of our specialty is much more important. In this context, we have to understand that many other interest groups and those responsible for statistics come into play. As glaring examples, I will mention two. The first and most obvious is the issue of cerebrovascular diseases. Sixty years ago, International Classification of Diseases (ICD) 7 decided that anatomically all strokes are diseases of vessels, and classified them under cardiovascular diseases! This served the interests of some groups, but not those who suffer a stroke or those who look after them. This will hopefully change with the World Health Organization (WHO) modernizing its International Classification of Diseases next year. This has led to the lumping together of the two most prevalent causes of death and disability, i.e. heart attacks and strokes. Both cardiologists and neurologists have clearly stated their opinion to the WHO that the two have different physiology, etiology, pathology, epidemiology, and clinical outcomes, and fall under different types of physicians. Both recommended rectifying this erroneous state back in 2011. We are now working closely with the WHO statisticians to remedy this anomaly while at the same time keeping statistical continuity when previous data are compared to new ones. The second issue in the Global Burden of Disease is that it had to utilize diagnoses based on ICD10 that are flawed and rather outdated, and therefore attribution is totally dependent on the original etiology. Let me explain. When including statistics on epilepsy as an example, the Global Burden of Disease only included primary generalized seizure disorders and not any other forms of epilepsy! This means that perinatal injuries as well as all post-traumatic epilepsy in general are classed under injuries, post-meningitis/encephalitis epilepsy under infections, and so on. This may sound bizarre, but this is how the situation is in the world we live in. Moreover, neurologists deal with complications of general medical and toxic conditions, but the burden lies outside neurology. All neurological complications of diabetes, alcohol abuse, and toxic etiologies, as examples, are classed as due to the original issue, however remote. This leaves us with a major deficiency in our statistics and makes the majority of our work attributed to some other specialty. One can understand the dilemma of statisticians producing classifications and the major pressures they experience. However, this rather rigid procedure may “simplify” various matters but it does not serve the accurate reporting of specialty-specific complications. Moreover, it will not help epidemiologists who are interested in ensuring that clinicians seeing such complications report and categorize them accurately. Dementias are the leading cause of death and disability, and the incidence is increasing exponentially. The matter is beyond the health finances of most countries. Again, neurology is short-changed here. I do not think that it is recognized by many health providers that dementia is an organic disease of the brain. However, traditionally our psychiatrist colleagues deal with many aspects of the condition, and hence it is a joint endeavor between both disciplines. This is yet another reason why talking about brain health is in many ways a better description of all the disorders that we deal with on a daily basis. When this logic is followed, there is no doubt that brain disorders are by far the leading cause of mortality and morbidity. We, as those responsible for looking after millions of affected individuals, must make our voices heard and be advocates for our patients. Some of these issues may sound obvious to some practicing in the more developed world, but it certainly is not the case in most parts of the world. Even if we look at the more developed sections of the world, we will find a huge discrepancy between various geographic locations, sometimes within the same country. Care provision is certainly not uniform, and it is our duty to inform the public of what is available and feasible in their localities so that the correct provisions can be made. Globally, the number of neurologists is woefully low. It is most important to emphasize that our numbers are increasing, but so is the need for our services. This puts a huge pressure on us to perform efficiently with meager resources. Training is the way ahead, and perhaps as important is for us to emphasize that it is not enough to have neurological training programs without the support of the most essential specialties for proper service provision. Along with neurologists, health care providers will need neurosurgeons, neurophysiologists, neuroradiologists, reliable laboratory services, physiotherapists, geneticists, psychiatrists, immunologists, and nurse specialists. I could go on, but the point is made that we cannot work in isolation. When addressing these facts to governments, we have to clearly state the benefits of such integrated systems, and only then can neurological health provisions make inroads into the death and disabilities related to brain diseases. I have so far stayed away from research, which is the cornerstone of our progress. This is performed now at varying levels in all parts of the world. Encouraging collaboration between regions and institutions is a core responsibility of the WFN, which we diligently pursue. 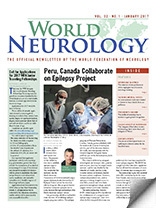 The profile of neurology has to increase, and our role in global health is being more recognized. The road is long, but the obstacles are not insurmountable. Most of this is in our hands.